I love birthdays! They offer the perfect excuse to make cakes, particularly fat layer cakes that make you feel like a giddy six year old. For my mom's birthday, I wanted to make a cake that incorporated her favourite classic chocolate buttercream frosting. Of course it's a perfectly wonderful frosting, but it is so common. I'm a baker and I wanted to make an out-of-this world cake that would blow all other cakes out of the batter. My plan was to make a 4 layer cake with various fillings including: Strawberry cream (which I did use), a chocolate hazelnut mousse, and a dark chocolate ganache. As you can see, my vision of a 4 story cake ended up a run of the mill 2 story. I have learned that I should never allow my supply of parchment paper to dwindle down to one measly, useless strip. Everything was planned ahead and I was ready to spend the afternoon in my happy place. When I reached into the drawer and opened the parchment paper box and realized that it was dead, I didn't panic. I used to always make cakes by just buttering and flouring the cake pans, no worries. Apparently my cake pans have been spoiled by their caviar-style of living and being pampered with parchment for too long. And they are deceitful little things. Out of what I am sure was sheer spite, they allowed the cakes to bake up beautifully. I pulled them out of the oven and let them rest for a few minutes. I felt their full force of vengeance when I attempted to remove the poor defenseless cakes. The cake pans must have had a great laugh as I made many feeble attempts to make them release their hostages. What was so frustrating was that I had to be gentle so the cakes wouldn't break, All I wanted to do was throw something, anything, across the room and take out a few windows in the process. After much nudging, prodding, cursing, and pleading, I managed to free two of the four cakes. The others, sadly, did not make it. One of the freed cakes had a few battle scars which had to be patched up with frosting. To say I was mad would be a severe understatement. I hate it when things go awry when I bake, especially when it's for someone else. In a large bowl, beat the butter on medium speed for about 2 minutes until soft and fluffy. Beat in vanilla. Add the cocoa powder and beat to incorporate. Alternate adding the confectioners sugar with the Liqueur (or cream) and beat after each addition until you have the desired consistency. Add more or less sugar depending on how sweet you like your frosting. In a large bowl, beat the jam and butter together until smooth. Slowly add the confectioners sugar and continue beating until thick yet spreadable. Place one layer of cake on a large plate. Using a serrated knife, carefully slice the very top of the cake so the surface is flat. Spread with the strawberry filling. Use as little or as much as you like. If you have some left over, use it for muffins or scones. Place the second layer on top of the strawberry filling and gently press down to stabilize it for frosting. 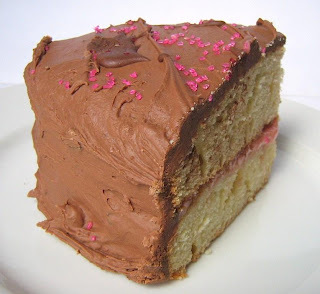 Cover the top and sides of the cake with the buttercream frosting. Let the frosted cake set for about 20 minutes before serving. 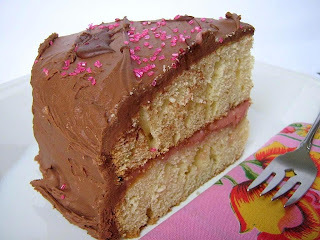 Yellow cake with chocolate frosting is my all time favorite birthday cake! I remember seeing this recipe on SK, and your rendition looks wonderful. I'm sorry about the mishaps trying to get the cakes out of the pan. That's SO frustrating! I've had it happen several times with bundt cakes and it just makes me lose my mind. The cake still looks lovely and perfect to me! Happy birthday to your mom! Growing up, we never had parchment paper for the bottoms of our cake pans. Grandmother always used wax paper or a greased brown paper sack. Our cakes never stuck to the pan or sides of the bread pans. As long as the wax paper is not exposed to the oven, it will not burn. All her fruit cakes were lined in oiled, brown paper sacks. 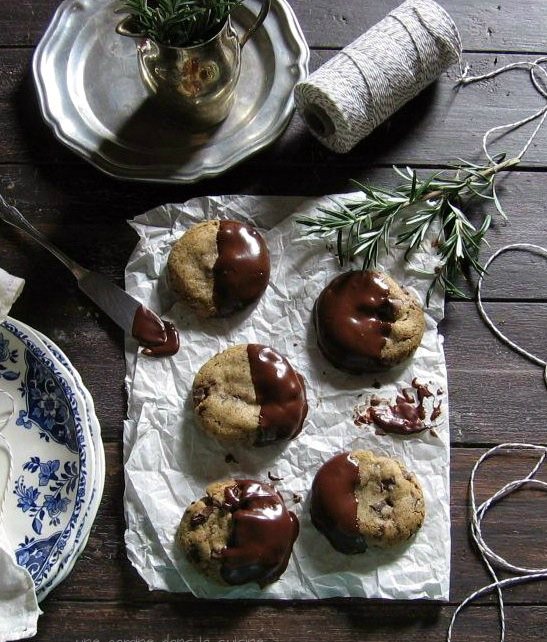 So, next time you run low on parchment paper, pull out the wax paper. Thanks Jessica :> Bundt cakes can be so brutal sometimes. My mouth is watering looking at those photos. I LOVE yellow cake but have yet to find a good recipe. I think yours sounds/looks perfect. I agree with anonymous -- I have used greased and floured brown paper bag, and it's worked just like parchment paper. I'm sure your mom loved this cake. Ever make cake balls? It's a good thing you saved those cakes... 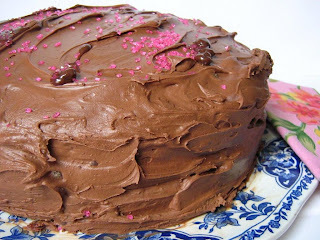 If you mash the cake up w/ frosting, roll the frosting cake mixture into balls, freeze them, then drop them in melted chocolate (or even better, cocoa candy coating from Wilton) you have an awesome treat! And you can google cake balls or cake pops to find more! Aww! Sorry you had so much problem with this! Cake looks delicious anyway. Even I'm wondering what it would have been though! Maybe you could make it someday, please? And next time, you could sub parchment with any other greasy paper, such as wax paper [what I use], butter paper etc.